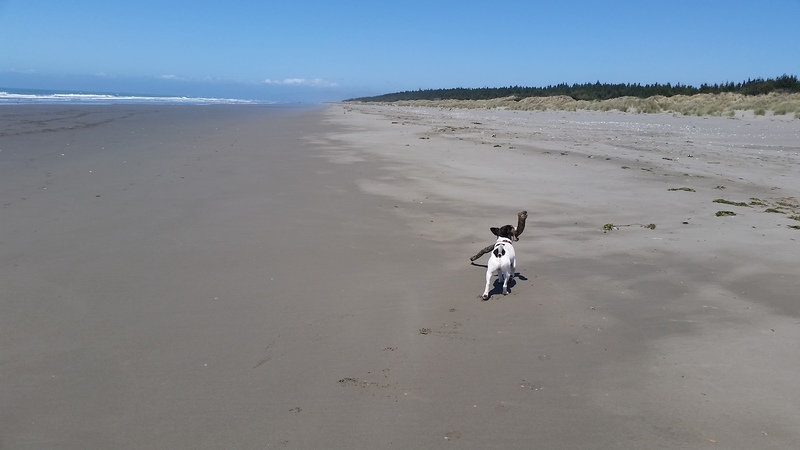 Welcome to the fifty-ninth stoat snippet! These snippets are a short update on the Orkney Native Wildlife Project, which is a partnership between RSPB Scotland, Scottish Natural Heritage and Orkney Islands Council, and will also try to address any concerns that folk have raised with the project. As you might remember we have been busy pulling the paperwork together so that we can recruit the next set of jobs for the project. The first five roles are all now advertised, so that’s the – Programme Manager, Administrator, Eradication Operations Manager (2 posts), Biosecurity Officer and Communications Manager. The closing date for all these jobs is 26 November and interviews will take place between the 6th and 17th of December. We are currently finishing the paperwork for the next set of jobs including the trappers (10 posts), Community Engagement Officer, Education Officer and Monitoring Officer who will look after the citizen science and research parts of the project. We hope to have these live early next week with interviews in early January. The dog handlers and research assistants will be advertised later next year. Once the final job adverts are out, we will turn our attention to securing land access permissions once more. 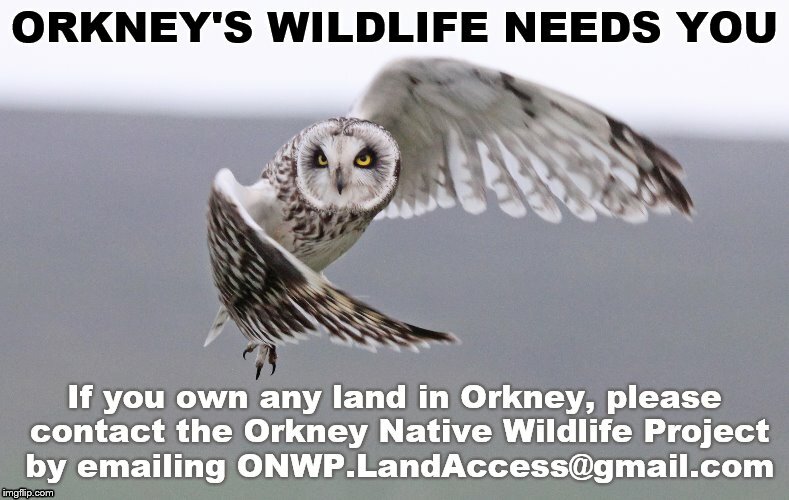 So, if you own land in Orkney, even if it’s just your garden, and we haven’t spoken to you, please email us at ONWP.landaccess@gmail.com as soon as you can. We’ve also heard from Ange, that Macca has completed his ten-day stint in quarantine and is now out and about in New Zealand. She sent these photos of him playing on the beach, taking a well-earned break before they start their next job. 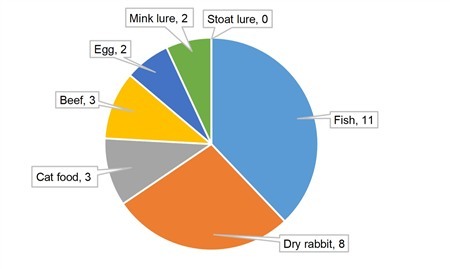 As the autumn trapping trial checks are now finished, we can share the results with you. Over the six checks, a total of 29 stoats were caught, with ten in Grimbister, ten in Hobbister and nine from the Wideford traps. Twenty-one were caught by traps in heathland and eight by those in farmland. The double set DOC 150s caught 25 stoats and the single set DOC 200s four stoats. Of the ones where we could identify the gender, sixteen were male and six were female. 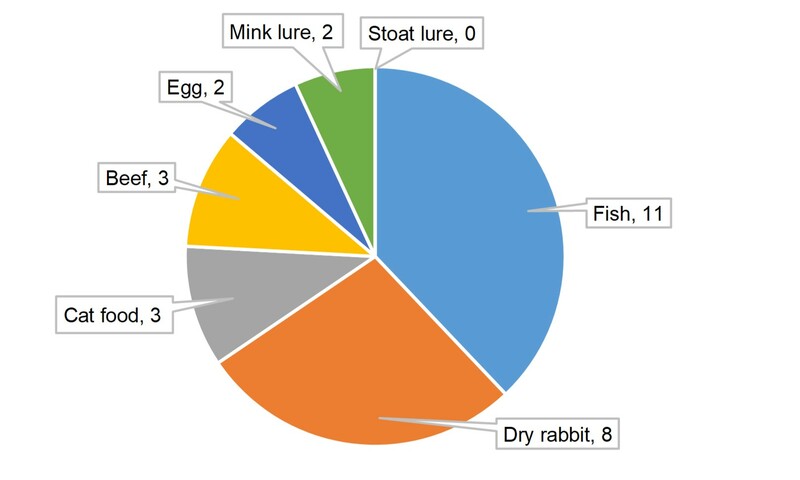 A good range of baits attracted stoats (see below), except strangely the stoat specific lure so we think there may have been a problem with that batch. 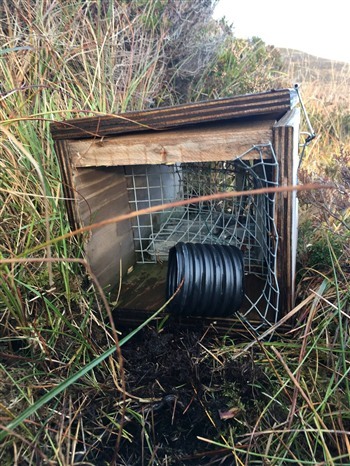 The trapping trial traps will be re-deployed in north Hoy and on Rousay as part of the biosecurity trap network. This includes 25 that were brought in on Monday from Grimbister which will be put out in north Hoy on Friday or next week at the latest. The traps in Stromness were checked on Monday and one stoat was caught. Carmen checked the Orphir traps today ably assisted by Lindsey. No stoats were caught in these traps. Lindsey has also offered to check the Kirkwall traps later this week to help as Marina has been away for a few days. Once she is back she will be checking the traps in Evie and Rendall. You’ll remember that the Graemsay biosecurity trap network will be checked monthly with the first check due shortly. We hope to start getting further biosecurity traps out on Rousay in the coming weeks to strengthen our early warning system. 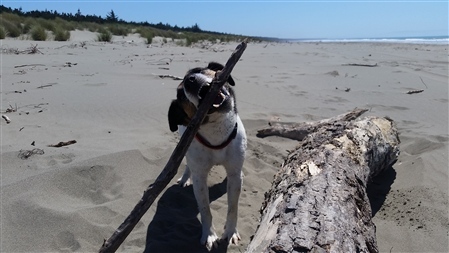 The biosecurity trap network is crucial, but so are folk on these islands continuing to report sightings because stoats could potentially move back and forth between the islands and Mainland at any time. Shapinsay: The next round of checks for the Shapinsay traps are not due for a couple of weeks. However, we’ve been alerted to another potential sighting of a stoat on the Stoats in Orkney Facebook page and we are following this up. We are grateful to everyone who submits potential sightings as stoats could arrive on islands at any time and could also swim back and forth to the Mainland. We’ll let you know when we know more. Hoy: We haven’t been out to Hoy or South Walls since last Friday as these traps are only scheduled to be checked fortnightly. However, when Heather was checking the traps in north Hoy last Friday, she was really upset to discover that one had been vandalised. It looked like someone had kicked in the wire screen on both ends of the trap. This is particularly serious because the screens are designed to prevent animals larger than stoats (including pets) accessing the trap mechanism. And importantly, we now have a trap out of action, making our defence lines slightly less robust and we have to spend valuable time repairing this. It is important to try to prevent stoats reaching Hoy. Hoy is within swimming distance of Orkney Mainland which is why we have biosecurity traps in Stromness and Orphir to try to catch any stoats that might be leaving Mainland as well as traps in north Hoy to try to catch any that might arrive. The terrain of Hoy would make finding and removing a small population of stoats particularly difficult and Hoy is incredibly important for ground-nesting birds which would be under huge pressure from stoats because there are no voles in Hoy. 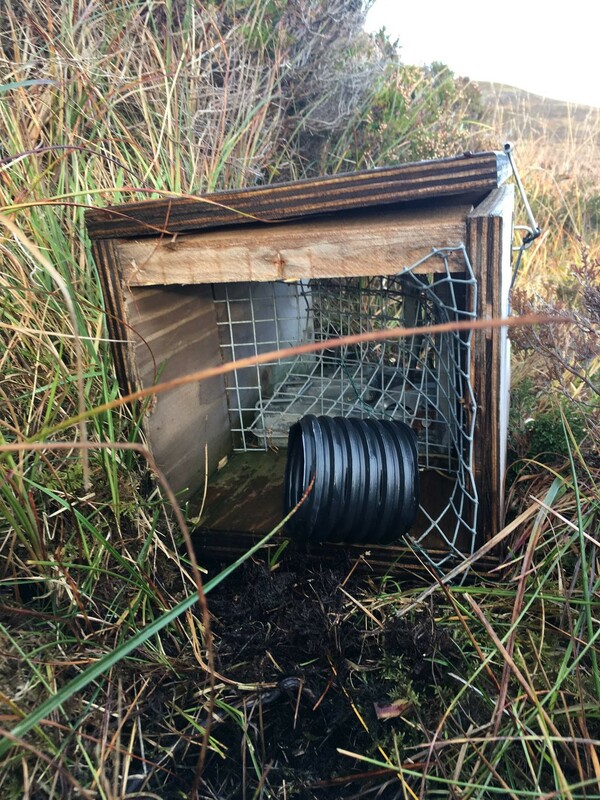 We implore everyone to respect the trap network that has been deployed with permission of landowners to protect Hoy’s wildlife and to instead raise any concerns with the project team. Thank you. Remember, if you have any comments or concerns please contact north@nature.scot or orkney@rspb.org.uk, or by calling RSPB Scotland on 01856 850176 or SNH on the number below.